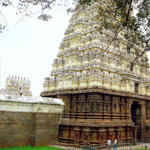 VELLORE FORT TEMPLE :The temple, dedicated to Jalagandeeswar, is noted for its sculptures, and speaks volumes of the exquisite craftsmanship of the highly skilled artisans of that period. The sculpture in the porch on the left of the entrance is a masterpiece appreciated by the connoisseurs of art and architecture. The temple was long used as an arsenal, and remained without a deity, although several years ago it was sanctified with an idol of Lord Shiva.